The Energy Department, responding to a security scandal at the Los Alamos weapons lab, ordered a halt Friday to classified work at as many as two dozen facilities that use removable computer disks like those missing at the New Mexico lab. CBS News Correspondent Sharyl Attkisson, who began investigating lax security at Los Alamos more than five years ago, reports the unprecedented standdown affects nearly all classified operations at dozens of facilities responsible for weapons design, national security research, and other sensitive work. Energy Secretary Spencer Abraham said the "stand-down" at DOE operations that use the disks, containing classified material involving nuclear weapons research, was needed to get better control over the devices. The disks, known as "controlled removable electronic media" or CREM, have been at the heart of an uproar over lax security at the Los Alamos National Laboratory, where work has been stopped as scientists search for two of the disks reported missing on July 7. Fifteen workers have been suspended, including 11 who had access to a safe where the disks were stored. Officials believed they had been accounted for in an April inventory, but that also is being questions because of possible irregularities in that audit. The missing Los Alamos disks raised concern within the Energy Department about the handling of the devices at other facilities involved in nuclear weapons research, department officials said. Abraham said he wanted to "minimize the risk of human error or malfeasance" that could compromise the classified nuclear-related information held in the devices that are used at DOE facilities nationwide in nuclear-related work. "While we have no evidence that the problems currently being investigated (at Los Alamos) are present elsewhere, we have a responsibility to take all necessary action to prevent such problems from occurring at all," Abraham said in a statement. The department declined to identified the sites that will be affected by the work suspensions, beginning Monday. The directive was sent to all 59 DOE facilities nationwide, but the number actually affected is expected to be "less than two dozen ... but more than 15," said a senior DOE official, who spoke on condition of anonymity. The stand-down involves classified work across the government's nuclear weapons complex wherever the CREM storage devices are used, the official said. It will continue until an inventory of the devices is completed and new control measures on their use is put in place, said DOE spokesman Joe Davis. Employees using the disks also must undergo security training. "There will be disruptions to ongoing projects," said Davis. "But we view this as a necessary step to make sure that we have a complete accounting." At many of the facilities unclassified work will continue and "a lot of stuff will continue to go on," said Davis. Among the sites affected are the DOE's other two major nuclear weapons research laboratories: Lawrence Livermore in California and Sandia in Albuquerque, N.M.. where a classified disk was missing and then reported found last week. Livermore spokesman David Schwoegler said 876 of Livermore's more than 9,000 workers have access to the security sensitive CREMs targeted by the DOE directive. "Those would be the only people that would be affected," said Schwoegler. Coincidentally, he said, the lab already had a regularly scheduled inventory of all CREMS planned for next week. Among the other facilities that will suspend classified work are the Argonne National Laboratory outside Chicago; the nuclear weapons plant in Oak Ridge, Tenn., and the Brookhaven National Laboratory in New York. Steven Wyatt, DOE spokesman in Oak Ridge, said the Y-12 nuclear weapons plant and parts of Oak Ridge National Laboratory are affected. The work disruptions across the government's nuclear weapons program comes as officials at Los Alamos continue their search of the most secure areas of the 43-square-mile facility for the two missing disks. Abraham said more than 2,000 safes and vaults were being examined. 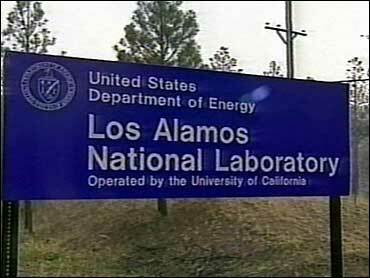 Work at the nuclear lab, which created the first atomic bomb, has been suspended for a week. The missing disks incident was the latest in a series of embarrassments at the New Mexico lab, including security breaches and allegations of mismanagement and theft. The Energy Department has said that for the first time it will put the contract to manage Los Alamos — held by the University of California for 61 years — up for bid when it expires in 2005. "The analogy of the straw that breaks the camel's back is appropriate," he warned in an open letter. When asked what will be the cost of suspending classified research that's said to be vital to national security, an Energy Department spokesman told Attkisson it's a step that had to be taken -- that the research is meaningless if it's compromised.